India is the largest importer of arms in the world, followed by Saudi Arabia and China. Indian Navy anti-warship cruise missiles on display at a naval base along the coast. The international arms trade, facilitated by increased globalization, is lucrative, owing to little legal control.The market involves the manufacture, selling, buying, and licensing of military equipment, weapons, and facilities such as small arms, armored vehicles, military ships, ammunition, and military aircraft. Importations are mainly driven by economic growth, territorial disputes, and political alignments. Most of the importing countries buy arms from more developed countries with high-tech capabilities to engineer high-quality arsenals. India has experienced a surge in economic growth in recent years. Increased resources to buy arms have made it the world’s largest importer of weapons taking up 14% of the world’s imports. 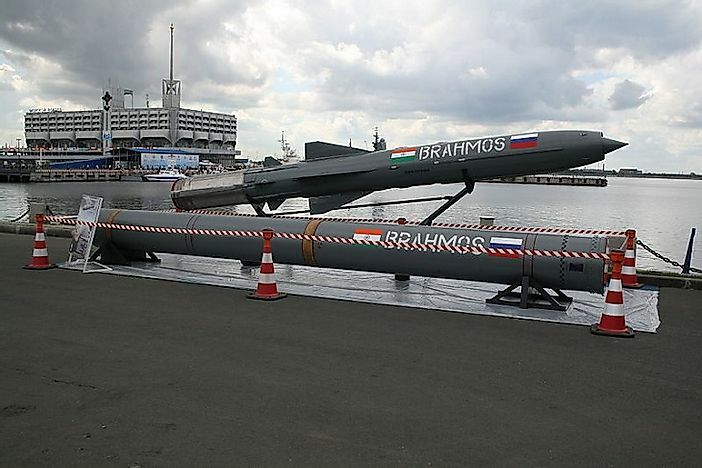 India’s military for years has experienced a shortage of arms after the Soviet era and has been on a quest to restock it. In the last three years, India imported arms worth $14 billion. These efforts have been aimed to boost its influence in the region amidst growing tensions with China. India has not had success in attempts at innovation and has relied on sophisticated designs from more developed nations mostly Russia and the US. In 2014, most of Saudi Arabia’s neighbors were involved in the war. Recent conflicts have increasingly torn such nearby countries as Syria, Iraq, and Yemen, and this drove Saudi Arabia to increase the stock of its military hardware, accounting for 7% of the world’s arms imports. Saudi Arabia has sought to attain a strategic role in the region and has also intervened in some of its conflict-ridden neighbors such as Yemen. Saudi Arabia also feels threatened by Iran especially with looming alliances between Iran and the US. Saudi Arabia is an oil-rich country with plenty of resources at its disposal to purchase sophisticated machinery and ammunition. In 2015, the state spent $9.8 billion on arms. The primary source for its arms was the US, the UK, and France. China takes its place as the third-largest importer of weapons at 4.70 % of world total imports. China has established itself as an emerging economy in Asia, becoming an exporter of global arms to poorer nations as well. China has sought to assert its influence over the region and stamp out threats especially from India.Arms imported to China have been on a decrease, due to the expansion of its local industry in military capabilities and has had to rely on more developed countries for certain types of machinery such as large aircraft, submarines, and engines for vehicles and warplanes. With an increased military defense budget, China spent $2.6 billion on arms in 2014. Its largest arms supplier is Russia followed by the US. The United Arab Emirates is an oil rich country in the Middle-East and is the fourth largest importer of weapons taking 4.6% of the global market. The UAE has attempted to exert its influence and take up a strategic role in the region by importing weaponry such as aircraft and missiles mostly from the US and France. All this has been in a bid to reinforce its military with high-quality arsenals and intimidate regional rivals. The UAE also intervened in military operations in its neighboring countries rocked with war such as Afghanistan and Yemen. The UAE spent approximately $3.13 billion to import arms in 2015. Other countries taking up their fair shares in the global importation of weapons are Australia (3.6%), Turkey (3.4%), Pakistan (3.4%), Pakistan (3.3%), and Vietnam (2.9%). Global spending on the importation of arms is expected to increase fueled by the emergence of middle class economies. Middle-East countries are projected to increase their volume of imports. Global attention is also being called for more stringent laws to govern the importation of arms. The increase in wars and conflicts has been attributed to countries being able to import arms with ease.